Faith « Joint Heirs Ministries International, Inc.
Joint Heirs Ministries International, Inc.
"The Spirit Himself bears witness with our spirit that we are children of God, and if children, then heirs—heirs of God and joint heirs with Christ, if indeed we suffer with Him, that we may also be glorified together." Contact Joint Heirs Ministries International, Inc. I am so excited to share with you what the Lord is doing with the Joint Heirs Evangelism team. Part of evangelizing is laboring to provide for people’s physical and emotional needs as well as sharing the gospel with them. For if we don’t take care of their most urgent needs, how can we expect them to be able to focus on the gospel and receive it? 14 What good is it, dear brothers and sisters, if you say you have faith but don’t show it by your actions? Can that kind of faith save anyone?15 Suppose you see a brother or sister who has no food or clothing, 16 and you say, “Good-bye and have a good day; stay warm and eat well”—but then you don’t give that person any food or clothing. What good does that do? Shanika, Bangi and I have been discussing and praying about different ideas to go and make disciples of all men, and one of our goals is to provide warm blankets and plastic bed mats for the homeless. Therefore, we need your help. We are asking each of you to buy one thermal blanket and bring it to the church by Sunday, December 22. The blankets will be laid at the altar, where we will all gather to pray over them. In this way, we are meeting both physical and spiritual needs, because these blankets will be covered in prayer. Therefore, every time someone covers him/herself with one of these blankets, that person will be covered with prayer. This is our first step toward evangelizing the homeless, and each one of you will play a vital role by doing this. Our next step in evangelizing the homeless is to provide each one with a plastic water-resistant bed mat, handmade by each person in the church who would like to do this. Even if you are unable to help make the bed mats, you can still help with this project by saving the plastic bags you get from Walmart, Food Lion, the Dollar Store, etc. and bringing them to church, so that we can work on making the bedding right away. Praise the Lord! Just think of the many people you can help just by doing something as simple as this! For those of you who are interested in making the plastic bed rolls, please contact Sister Shanika or Sister Cheryl. If you know how to crochet, they are very easy to make. If you don’t know how to crochet, but would like to learn, contact Sister Cheryl, and she will teach you. We will be praying for the person who receives each bedroll, as the Spirit leads, trusting that as they lay their bodies down to rest on the bed roll each night, they will feel the Almighty’s presence and be drawn to Him in Jesus’ name. 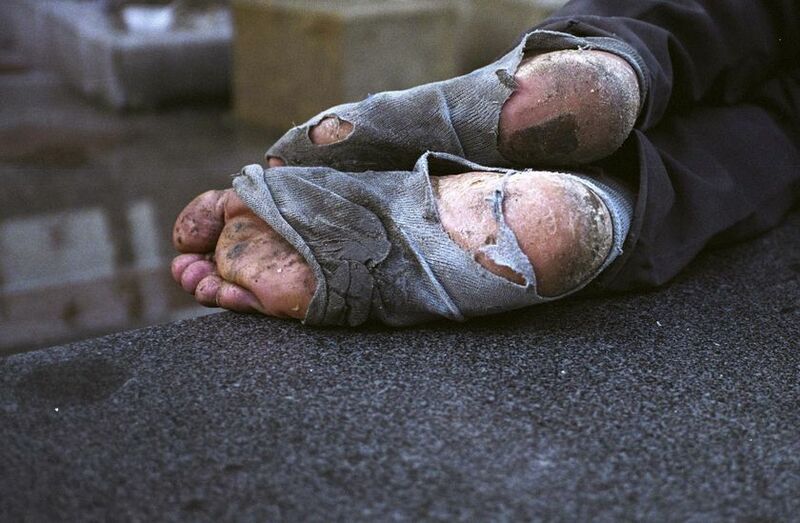 May our heavenly Father bless each one of you for giving of your time and gifts to the homeless, in Jesus’ name! This entry was posted in Evangelism and tagged Beloved Brothers and Sisters, Blanket, Blessings, brothers and sisters, Christianity, Evangelism, Faith, Food Lion, Homeless, Homeless Jesus, Homelessness, Hope, Joint Heirs Evangelism, Lord, Love, Prayer, Religion, Religion and Spirituality, Theology, Timothy Schmalz, Trinity Broadcasting Network, Walmart. Greetings Beloved Readers and Church Family! As you know, Joint Heirs Ministries’ Evangelism Outreach is ready to take off. You, beloved members of Joint Heirs Ministries International, Inc., are already part of our yearly Thanksgiving Day Celebration Outreach, as we prepare a meal to share with those in the community who are needy and/or lonely. Our goal with this outreach is to share the love of Jesus with them, while sharing a home cooked Thanksgiving meal to fill their bellies. Our next outreach is for the homeless in our community, and we need everyone’s help with this. We are asking each member of the church to donate a thermal blanket so that we can make sure the homeless who are turned away from the Christian Shelter in Salsibury, MD will be given a blanket to help keep them warm. If you are able to donate more than one blanket, praise the Lord! That would be wonderful. Please bring your blanket offering(s) to the church by Sunday, December 15, 2013, so that we can pray over each of the blankets before we distribute them. By praying over the blankets, though we may never personally know every person that receives one, we can know that every time they cover themselves with the blanket we donated and prayed over, they are being covered by our prayers for their salvation, their deliverance and their lives. Isn’t this awesome? Everyone, please start saving those bags and use them to make bedding. I know we’re small church, but we’re mighty in the Lord, Just think of the men, women and children we can help, by doing something as easy as this! For those of you who already know how to crochet, please let Elder Cheryl or Sister Shanika know if you would be willing to help others who don’t already know how to crochet, learn how to do it. This entry was posted in Evangelism and tagged Christ, Donation, Evangelism, Faith, Heirs Ministries, Holy Spirit, Homeless, Homeless Jesus, Homelessness, Hope, Inc., Inspiration, Inspirational, Jesus, Jesus Christ, Joint Heirs Ministries International, Joint Heirs Ministries' Evangelism Outreach, Joy, Kindness, Lord, Love, Religion, Religion and Spirituality, Sleeping bag, Spirituality, Thanksgiving Day Celebration Outreach, Theology, United States.